Surrounded by tropical palms, the zero entry family pool features waterfalls, a fountain and foot massagers. 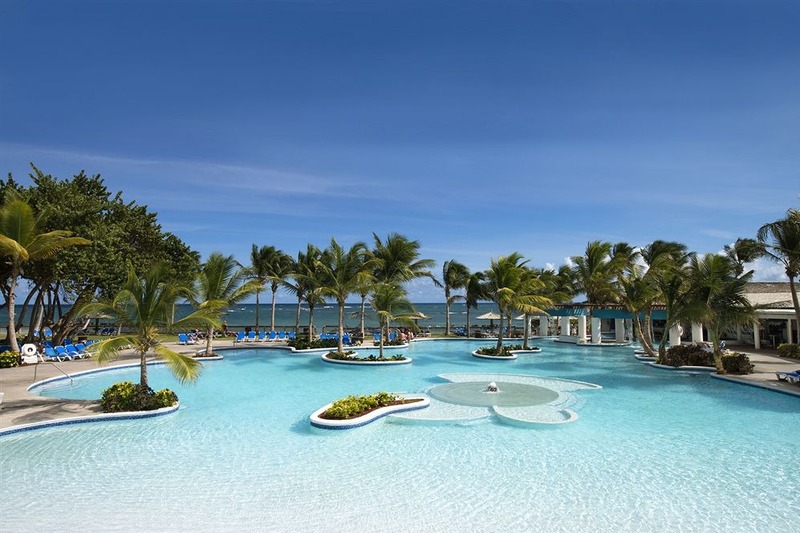 Located on St. Lucia’s exotic south coast, the all-inclusive Coconut Bay Beach Resort & Spa appeals to guests of all ages. The resort features an adult section (Harmony) on one side and a water park and playground (Splash) for all ages on the other side. There are 250 air-conditioned guest rooms at Coconut Bay, split between the adults-only and family sections. Rooms range from basic garden view to premium ocean front, and connecting rooms are available for families. All rooms feature private balconies or patios, separate sitting areas, mini-fridges, ceiling fans, and flat-screen TVs. There are four restaurants, a beach grill and six bars at the resort. Dining options include Coconut Walk, the resort’s main restaurant serving breakfast, lunch and dinner daily; Calabash, the resort’s specialty restaurant featuring steaks, seafood, and island cuisine; Silk featuring modern Asian cuisine; Capri, for Italian cuisine; and the Beach Grill, located near the swim-up bar. Bar highlights include a rum bar and an adults-only bar with wait service in the Harmony section of the resort. There are five pools at the resort: two in the adults-only section, and three in the family section, plus a large water park with a lazy river. Additional resort amenities include a complete fitness center, tennis and basketball courts, a full service salon and oceanfront spa, a supervised kids’ club, daily activities, nightly entertainment, and a water sports shop on the beach. Fly into Hewanorra International Airport (UVF), St. Lucia. Coconut Bay Beach Resort & Spa is located less than ten minutes from the airport. Visit Coconut Bay Beach Resort & Spa’s website for more information.